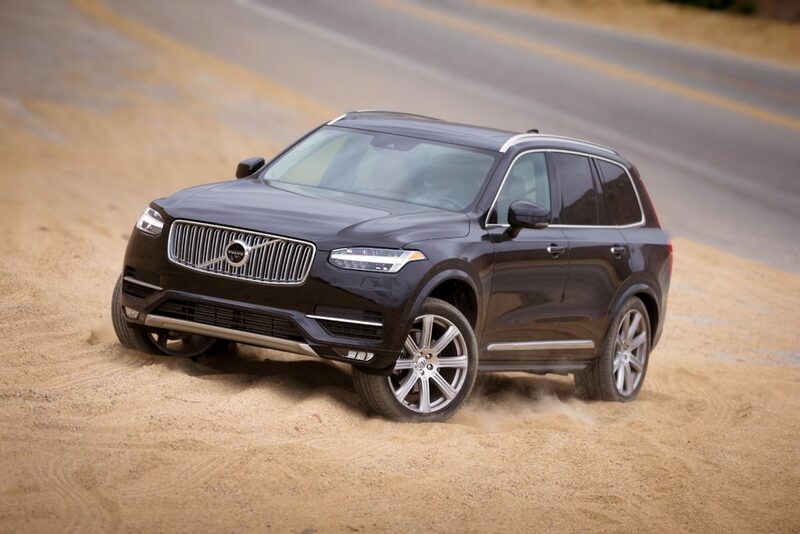 The second-generation of the Volvo XC90 SUV was introduced to much fanfare for the 2015 model year. It's Volvo's flagship and most important automobile. See the second generation XC90 Forum here. 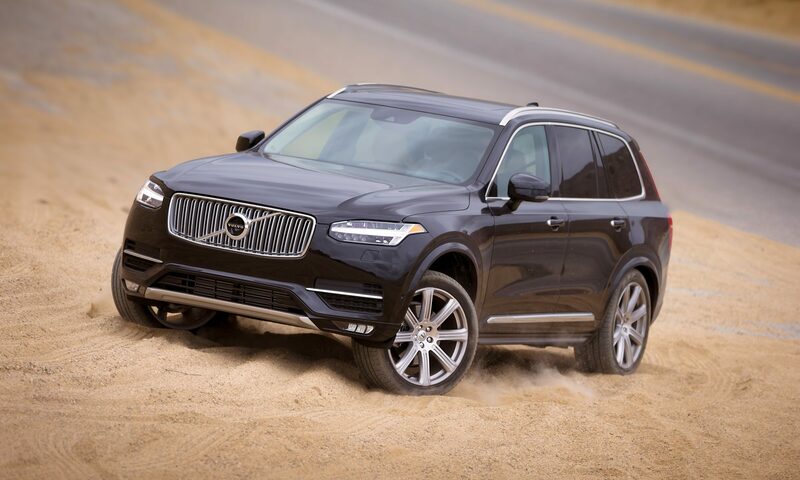 The new Volvo XC90 — second-generation of Volvo’s flagship XC90 SUV — was introduced to much fanfare for the 2015 model year. The first 1,927 vehicles sold were available only by special digital order, and were individually numbered and specially badged (vehicle #1 was purchased by the King of Sweden). After these initial vehicles were produced, regular production and ordering began. Like the S90, V90, and V90 Cross Country, the XC90 is built on Volvo’s new Scalable Product Architecture (SPA) platform. The XC90 was Volvo’s first vehicle produced on the SPA platform, and it shares the drivetrains that would later become available on those other models. While 5-passenger seating is the standard option, many XC90 trim levels have 7-passenger seating, making it one of only a handful of SUVs currently on the market with 3rd-row seating. Available engines have also be reduced to only 4-cylinder setups, reflecting Volvo’s move to high-output turbo and/or supercharged 4-cylinder engines across their entire lineup. When compared to the first-generation XC90, the completely redesigned new Volvo XC90 is longer, wider, and lower. It also has the potential to be heavier than its predecessor, though this is mostly due to a hybrid drivetrain being available (non-hybrid models are roughly the same weight as the first-generation). Available engines have also be reduced to only 4-cylinder setups, reflecting Volvo’s move to high-output turbo and/or supercharged 4-cylinder engines across their entire lineup. Momentum — The base trim level, though not “basic” by any means. It comes standard with many traditionally luxury features, and can be optioned out to much higher specs. R-Design — This trim level is intended to be sporty rather than luxurious. Though it doesn’t have any powertrain features that aren’t available in other trims, the seats, wheels, and suspension are intended to feel sportier than the Momentum. Inscription — Best considered as a traditional luxury trim, the Inscription level provides standard features like upgraded leather seats and nicer gadgetry, climate control, and so on. Excellence — “Opulent” is the best word to describe the Excellence trim level. It’s more than simply having every option box checked (though it is that too), it also has a lot of features that aren’t available at all on the lower trims. For instance, it has 4 bucket seats (as opposed to the 5 or 7 passenger seating on the other trims). The backseat center console has a cooler, and all four seats have ventilation, heating, and massage functions. There is even a dedicated touchscreen control for the rear passengers to individually control the backseat environment. We haven’t even touched on the available drivetrains yet, and already you can see that the options available when purchasing an XC90 are a bit overwhelming. While some might see this as a good thing, the sheer number of things to weigh and consider might steer some away from the XC90. This stands in stark contrast with its sister the V90 Cross Country, which comes standard with most features and only has a couple of additional options available. T5 — This is a turbo-charged 4-cylinder FWD drivetrain configuration. It puts out 250hp and 258ft-lbs of torque, and is available on the Momentum and R-Design trim levels. T5 AWD — Exactly the same engine as the T5, but with AWD instead of FWD. It’s also available on the Momentum and R-Design trims. T6 AWD — This takes the same basic engine as the T5, but its twin-charged (containing both a turbocharger and a supercharger). This pushes the output up to 316hp and 295ft-lbs of torque. The T6 is available only as AWD, and can be configured on the Momentum, R-Design, and Inscription trims. As hybrids go, Volvo’s T8 drivetrain is fairly unique. It’s getting it’s own section here, as it is too complex to properly explain in just a couple of sentences. It takes a twin-charged 4-cylinder gas engine for powering the front wheels, and adds an 87hp electric motor for powering the rear wheels. Additionally, another 47HP electric motor is placed in front of the transmission. A 9kWh lipo battery bank is used to power these motors. 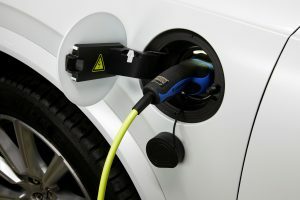 The battery can be recharged in a variety of ways: by plugging it into a wall (which takes 2-3 hours to charge it), using regenerative braking, or by using the gas engine. The combination of the battery and electric motors add more than 500lbs to the weight of the vehicle (compared to the T6 AWD). Hybrid — As the “standard” drive mode, this is what Volvo expects you to use most often. It attempts to do everything automatically — switching between the gas engine and electric engine (or both), which also in turn switches between FWD, RWD, and AWD. It does this based on what the computer thinks is most economical, as well as what’s needed for weather conditions. Furthermore, it also switches on the fly based on performance needs (firing up the gas engine for acceleration). In this mode, battery recharging is done with regenerative braking and with the gas engine. Pure — This will, as much as possible, use only the electric motor. Range on battery power only is supposed to be up to 15 miles. When the battery level gets too low, better acceleration is needed, or speed exceeds 75mph, the gas engine is started up. Save — The idea here is to save battery charge for later. Basically, it uses the gas engine primarily, but then will switch to the electric motor for low-speed city driving. Off Road — Only available for low-speed driving, this activates AWD while also increasing ground clearance (with the air suspension). Hill Descent Control is also automatically activated. AWD — Forces the use of both the gas engine and electric motor for use in slippery conditions. Power — Uses both the gas engine and electric motor to maximize performance. Individual — This lets you start with one of the other options, and then customize it to your own specifications. It should be noted that all of these settings make changes to more than just whether the gas engine or electric motor are being used. They also define things like ride height (via the air suspension), steering sensitivity, and suspension stiffness. The Individual mode can be used to refine those if you choose. The T8 is available on the Inscription and R-Design trims, and is the only option for the Excellence trim. The real question is whether you should even want it. Compared to the T6 AWD, the T8 increases the price of both the Inscription and R-Design by about $10,000. The Excellence trim, with the T8 as the only option, starts at $105,000 (though it does, of course, come with many luxury features). Fuel economy is only increased from 25/20 to 27/24, making the value of the upgrade questionable. When it comes to the cost of actually owning the vehicle, the value of the T8 is almost certainly even worse. Depreciation is more dramatic on the T8 models, with used prices roughly matching the T6 models after just a couple of years. 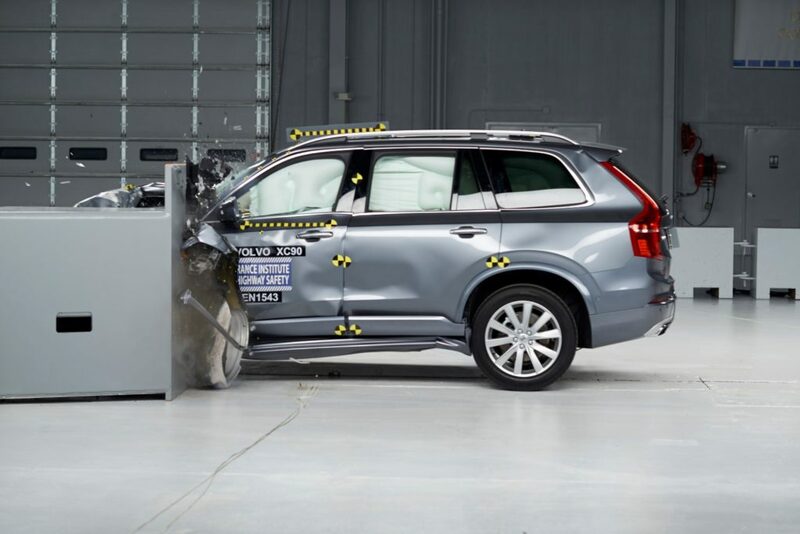 More concerning for those who plan on keeping their XC90 for years are the potential maintenance and repair costs. As you can imagine, a system as complex as the T8 is sure to make repair costs very expensive (and battery replacement would eventually be necessary). When it comes down to it, it seems that Volvo bit off more than they could chew with the T8, and potential XC90 owners will most likely be better off with the T6. Since its introduction with the first-generation for the 2003 model year, the XC90 has been Volvo’s best selling model in the US and worldwide. Like the second-generation XC90, the first-generation shared a platform (the P2) with Volvo’s large sedan (the S80) and large wagon (the V70). The XC90 was Volvo’s first entry into the SUV/Crossover market, which was later expanded with the XC60. This new Volvo XC90 is hugely important to the health of Volvo. It can’t be overstated — this SUV is the heart of Volvo’s offerings. Unlike its successor, the first-generation XC90 had a number of drivetrain options — including an inline 5-cylinder engine, an inline 6-cylinder, and a V8. 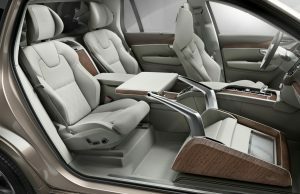 Features that would carry over to the new generation include 3rd row seating, an AWD option, and luxury appointments. Swedish production of the first-generation XC90 ended in 2014, when production of the second-generation began. However, Volvo then moved production to China, where it still sells the first-generation XC90 as the “XC Classic”. Only one configuration is available: a 2.5L turbocharged gas engine, AWD, and a choice of a 5-speed manual or automatic transmission. With so many different trim levels, and MSRPs from from $45k to $105k, the Volvo XC90 has many different technology and comfort features available. As you can imagine with a $60k range, the potential options and customization for an XC90 buyer can be quite overwhelming. That said, even the most basic model (the T5 Momentum) comes with a number of high-end features as standard. Some notable ones include: leather power front seats (with driver memory), dual-zone climate control, moonroof, driver-adjustable power steering (to change steering feel), driver alert control, keyless entry and drive, driver and center displays, Apple Carplay, rear camera and park assist, Sensus Connect and Navigation, and Volvo On Call. 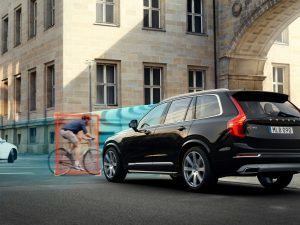 The City Safety system in the all-new Volvo XC90 features Cyclist detection with full auto brake, day and night. As well-appointed as a base Volvo XC90 is, it can become positively swanky with higher trim levels and as you add options. Covering all of them here would be impractical, but standout options include: upgraded seats with ventilation, heating, and massage, 360° Surround View Camera, paddle shifters, 4-corner adjustable air suspension, 4-zone climate control, 3rd-row air conditioning, park assist, pilot assist, and a number of interior and exterior styling upgrades. A thoughtfully-optioned 2015+ Volvo XC90 can certainly rival the refinement of most any other luxury model on the market. Legendary Scandinavian design and build quality make the XC90 a nice place to spend some time. Of course, this level of luxury does come at a price, which brings us to the question of value. Luxury car buyers are no different from anyone else — value still matters. Volvo, of course, knows this and has priced the XC90 accordingly. Other vehicles that potential XC90 buyers might be considering are the BMW X5 (MSRP starting at $55k), Mercedes-Benz GLS (starting at $67k), and Audi Q7 (starting at $49k). Considering the competition, the XC90 has a very reasonable base MSRP of $45,750. Comparing these models directly would take an article of its own, but we can do a brief rundown down of what to expect from base versions of each of the above models. Compared to the others, the XC90 has the lowest MSRP, the best gas mileage, but least power. Unlike the Q7 and GLS, it does not come standard with AWD, and unlike the X5 it is FWD. The XC90 is the only of these models to not include heated seats as standard. The Q7 and GLS also both have 3rd row seating standard, while the X5 and XC90 do not. When considered this way, the XC90 falls only slightly behind its competitors. But, again, we’re comparing base models here, and the XC90 is significantly less expensive. Bumping the XC90 up to a higher trim (like the Inscription) seems to push it ahead of all the others, while still being less expensive than everything but the Q7. So, how can you make sense of all of that, and which should you choose? A prudent shopper would think of it in one of two ways: simply choose which you like the best. Which has the exterior and interior styling that you prefer? Or, if you really have no preference, you’d be best served by building out each with the options you know you want, and going from there. 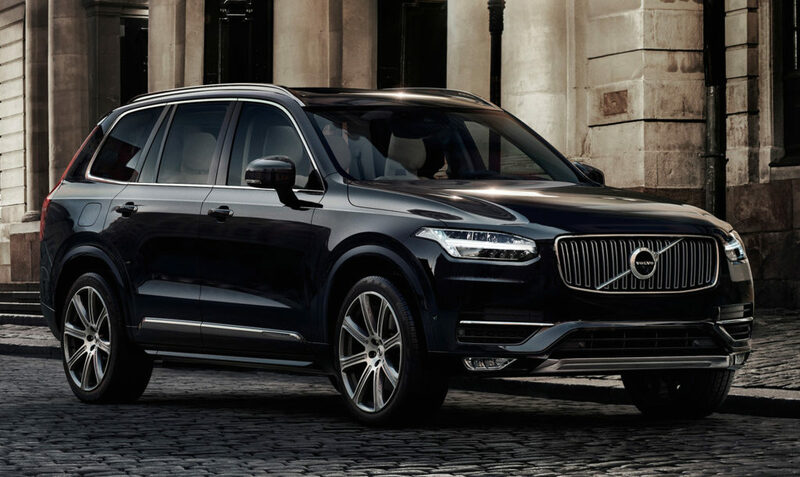 The second-generation XC90 is a solid competitor in this market, and is luxuriously appointed and virtually endlessly customizable. Some shoppers might be alarmed that the only engines available are 4-cylinders, but there is no denying that the power they make is impressive. Most buyers should avoid the overly-complicated T8, as it offers little benefit, but significantly increases cost (especially over the long term). And, of course, the appeal of uniquely sensible Swedish design and legendary Volvo safety shouldn’t be discounted. Owning & Maintaining XC90 2nd Gen. Longtime, trusted MVS forums Contributors June and SuperHerman chime in on XC90 driving impressions, maintenance costs and frequency. Like 99% of cars, the later the manufacture date, the better sorted it is in terms of reliability and maintenance costs. The nice touch screen panel is a huge hassle to use and one cannot drive and operate it without taking eyes of the road for too long – even for the seat warmer.